Should I stay or should I go? It’s a dilemma facing Celtic winger Mikey Johnston and many of the other fringe players at Parkhead. The 19-year-old has made only four first-team appearances thus far and his desire to add to that total must be tempered with the knowledge that the challenge facing him is formidable. Many promising youngsters have squandered crucial development time kicking their heels on the periphery hoping to be promoted when they could have been gaining valuable competitive experience elsewhere. Johnston scored in Celtic’s 4-1 win over Standard Liege in a pre-season friendly at Parkhead, an audacious finish to lift the ball over advancing goalkeeper Jean-Francois Gillet after being set up by Scott Sinclair, but the former ball-boy realises that there are no guarantees. 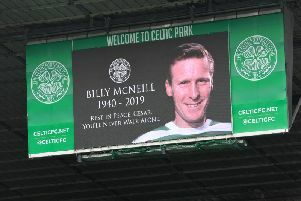 “I enjoyed the goal, of course; it was my first at Celtic Park so I’m delighted to have got off the mark and all my family was here to see it,” he said. The task facing him was evident during the opening 45 minutes when Celtic overwhelmed Belgium’s second representatives in the Champions League. Manager Brendan Rodgers’ decision to play with two up front appears to have significantly increased Celtic’s goal threat, with Odsonne Edouard and Moussa Dembele scoring one apiece and coming close on other occasions. Callum McGregor’s improvement continues apace and he also contributed a fine goal. Considering that Craig Gordon, Leigh Griffiths, Tom Rogic, Dedryck Boyata and Lewis Morgan were absent on Saturday and that new arrivals are pending, any hopes held by others of ending Celtic’s domestic dominance would appear to be little more than wishful thinking.